Modular belt conveyor systems are a highly robust solution for moving products and components within your plant. With a fully customisable design, these conveyors are suited to a wide range of manufacturing applications and configurations. 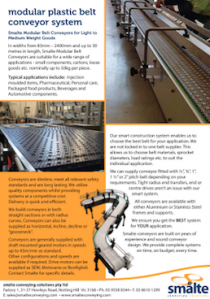 To learn more about powerful solutions for improving production in your plant, speak to the team at Smalte Conveying Solutions about modular belt conveyor design and construction. Our process and dedication ensure our products are of high quality and customised to the needs of individual facilities. Modular belt conveyor systems are a highly robust solution for moving products and components within your production facility. Suited to moving a wide range of materials, including small components, food products, loose goods and more, our modular belt conveyors are used across many different industrial operations. As one of Australia’s leading conveyor manufacturers, Smalte Conveying Solutions engineers custom solutions to meet our clients’ individual plant needs. Featuring uncompromising construction in stainless steel or aluminium and top quality belts, our modular conveyors are designed and built to last. Our engineers can modify this design to meets the demands of a broad range of handling applications: straight-running or side-flexing, and in horizontal, incline, decline or gooseneck configurations. Unlike other link-belt systems, these space-saving bends have no straight before and after the curve, making them extremely compact. They are a great replacement for belt bends, having the same smooth, compact operation at a lower cost and with reduced maintenance demands. With chain pitch of as little as 8mm, these belts can be used to create very tight product transfers. Belts fitted with angled rollers or balls are a simple and clever solution for carton alignment, rotation and side-transfers, without special controls. Applications include inspection, labelling and rejects. Please note: The above will also depend on what is best for your application.